Add the peas and herbs to a blender and mix until smooth. Add the ORGRAN Falafel Mix to a large bowl, add the pea + herb mix to it, add the water and season with cumin and pepper. Mix and let sit for 15 min. 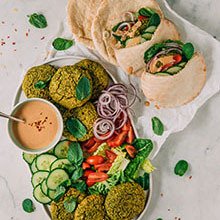 Line a baking sheet and with a tablespoon scoop out equal amounts of falafel mix and form into patties. Lay on the lined sheet and drizzle with a bit of olive oil. Bake for 20 min, flipping once half way.